A country without borders is just land. Written by C. C., a descendant of Chattel Slaves, for the descendants of Chattel Slaves and the Forgotten Americans. I am a Black American, one of the furloughed employees, and I live in one of the inner cities of California. Over many decades I have witnessed our communities being overrun and overwhelmed by illegal immigrants and refugees. The following are California’s population and demographic approximations. Non-citizens, many from Central America, have been allowed to take over an entire state while replacing its existing citizens, because the Democratic Party wants their Votes. A number of inner cities look worse than a 3rd would country. Established the Ku Klux Klan (KKK), a domestic terrorist group that tortured and lynched Black Americans and Republicans. Under Democrat President Lyndon Johnson welfare programs were put in place that penalized marriage, purposely, to lead to the breakdown of the Black family. Margaret Sanger, the founder of the Immoral Planned Parenthood, with the support of the Democrats, thru abortion, has exterminated over 20 million Black babies. This represents ½ of our Black population and this was her dream. As a further sign of disrespect, the Democrats now support selling our Black children for baby parts. Without abortion the Black American population could easily be over 70 million strong. Many of the inner cities, which are under Democratic control, have allowed 7000+ per year, of Black Americans, many of them children, to be killed without any intervention. Chuck Schumer, Nancy Pelosi, Rahm Emanuel, the Congressional Black Caucus, NAACP, Urban League, Al Sharpton, Jesse Jackson, CNN, MSNBC, and the majority of Democrats show fake outrage and shed fake tears when an illegal immigrant is hurt or inconvenienced in any way. When has Democrats ever shed a tear for a poor or homeless American child. When has Democrats ever shed a tear for Angel mothers, or police officers killed at the hands of illegals? Instead of Democrats touring the border they chose to tour Baltimore. This carnage in the inner cities has been taking place for decades, President Trump has nothing to do with it. Mr. President, this is my 3rd furlough with the federal government. I was furloughed twice under President Obama. Like most Americans, I live from paycheck to paycheck, and, as in the past, this will create a financial hardship for me and my family. The Real Dreamers are the American poor, veterans, homeless, and people in the inner cities who are the “Forgotten Americans”. Any politician or political party that puts other countries’ citizens above its own has no right to represent American citizens and should be voted out office. The primary responsibility of the Federal Government is the protection of ITS citizens. No Sanctuary Cities; Citizens should be able to sue politicians who protect illegals if they commit criminal acts against citizens. If the Democrats engage in investigating instead of legislating, investigate them and release their criminal and illegal acts. It is time for Black Americans to START taking our power and voice back through knowledge and reengagement. STOP being victims. STOP the extermination of our race by abortion. STOP voting against our own interest. STOP committing violence against our own people. STOP drug abuse. START standing on the shoulders of our ancestors, who were kings, warriors, and people of strength who paid the ultimate sacrifice so that we could live in Freedom. START putting God back in the center of our lives as our Civil Rights leaders did, who were men and women of Faith. Take back our birthright, which the U.S. Constitution guarantees, our rights as American citizens in the pursuit of life, liberty, and happiness. Take responsibility for the role we have played in the breakdown of our families and the dependency on the Government that replaced our fathers. We are children of God, Americans first, descendants of chattel slaves. "We the People Rising" is a grassroots, all-volunteer nationwide network seeking to influence – via activism – institutions of political corruption: the federal government – as well as state and municipalities – and the corporations and employers that hire and exploit illegal aliens. Hvidston heads up The Remembrance Project in California as the State Coordinator. The "Stolen Lives Quilt" initiative gives a voice to the thousands of Americans whose lives have been "stolen." The Remembrance Project Stolen Lives Quilt is made up of 3' x 6' banners that display the faces, names, and short story of three victims. The Quilt is intended to be taken to and displayed at rallies, city council meetings, vigils, and state houses across America; anywhere we can to remind people of the continuing injustice, unspeakable loss and suffering of our families. The members of the California Remembrance Project will display the Stolen Lives Quilt banners at the Chino Tea Party June meeting. Since late 2012, The Quilt has reached more than 16 states. We must insist that our public servants uphold all laws, in order to keep our families safe and to protect our jobs and resources. 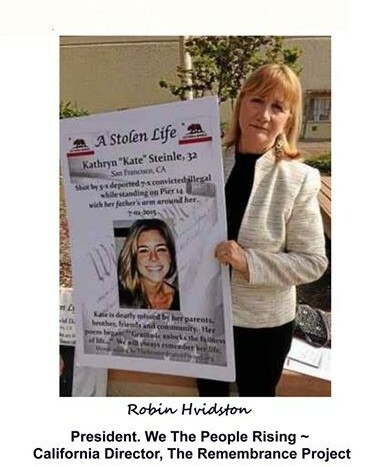 ​Already tens of thousands of Americans have been killed by illegal aliens. And now, with the current border crises that has made every state a "Border State", it is more important than ever to bring awareness to this very real American tragedy. The Remembrance Project is bringing national attention to these under-reported killings, and is "connecting-the-dots" through its initiative, the "Stolen Lives Quilt" - a visual memorial dedicated to slain Americans, who would otherwise still be alive and with their families, if only current laws were enforced. Hvidston has lobbied members of congress in Washington, DC as well as local congress members' district offices as an advocate for American workers, veterans, and homeless American families. She has appeared on local and national television stations, including CNN, as a reform advocate for securing the United States border. She is a frequent guest on radio programs such as Talkback with Chuck Wilder, CRN Radio Network and Frank and Friends on the topic of immigration and national security. Currently, Hvidston partners with organizations and grass roots activists nationwide and advocates that unemployed American workers, homeless American families and veterans be the focus of federal and state legislation not individuals who are unlawfully present in the United States.